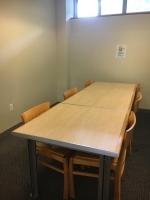 This room is an appropriate venue for group study, individual study, and any small meeting that involves conversation or collaboration. Room One seats a maximum of six people and contains a table, six chairs, and has power outlets for electronic devices. The room is NOT soundproof and conversation or volume of speakers should be kept at a reasonably low level. Please note: If your expected attendance exceeds the room capacity, we reserve the right to cancel your room reservation. 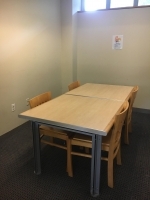 This room is an appropriate venue for group study, individual study, and any small meeting that involves conversation or collaboration. Room Two seats a maximum of four people and contains a table, four chairs, and has power outlets for electronic devices. The room is NOT soundproof and conversation or volume of speakers should be kept at a reasonably low level. 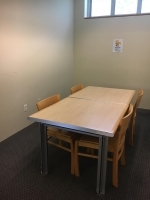 This room is an appropriate venue for group study, individual study, and any small meeting that involves conversation or collaboration. Room Three seats a maximum of four people and contains a table, four chairs, and has power outlets for electronic devices. The room is NOT soundproof and conversation or volume of speakers should be kept at a reasonably low level. 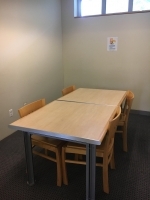 This room is an appropriate venue for group study, individual study, and any small meeting that involves conversation or collaboration. Room Four seats a maximum of four people and contains a table, four chairs, and has power outlets for electronic devices. The room is NOT soundproof and conversation or volume of speakers should be kept at a reasonably low level. educational, and civic use of the Library’s meeting rooms within the guidelines of this policy. Please note: The Trustee's Room is not available for individual/small group study, please request a study room for this purpose. First priority in the use of the Library meeting rooms will always be given to Library-sponsored and co-sponsored classes and events, and to such held in cooperation with the Library. Room Reservations are subject to cancellation with one week’s notice if the room is needed for Library use. Please note: If your expected attendance exceeds the room capacity, your request will be denied. 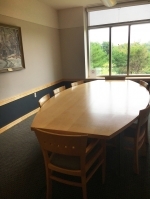 The Board of Library Trustees of the Tewksbury Public Library welcomes the cultural, educational, and civic use of the Library’s meeting rooms within the guidelines of this policy. Please note: First priority in the use of the Library meeting rooms will always be given to Library-sponsored and co-sponsored classes and events, and to such held in cooperation with the Library. Room Reservations are subject to cancellation with one week’s notice if the room is needed for Library use.